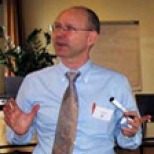 David Trickey is a renowned European expert in the field of intercultural management. He trains and advises many companies and organizations throughout the world while intervening regularly in International conferences and companies internal events dealing with diversity and intercultural problems. Furthermore, he has led a number of large scale projects in global mindset development for organisations in search of closer levels of connectedness across distance and culture. Alongside Nigel Ewington, he has developed numerous tools and training materials such as The International Profiler, the International Competency Set, the International Trust in Teams Indicator and the acclaimed training video ‘A World of Difference‘.